I haven’t been posting recently due to the fact that I have been feeling a bit under the weather. A couple of weeks ago, I caught a virus – I don’t think it was actually the “Flu”, but it certainly was a “flu-like” virus, and was bad enough to lay me up in bed for a couple of days. And even though I have technically recovered from it, it has left me feeling exhausted and weak. I simply have not had the energy to write blog posts! 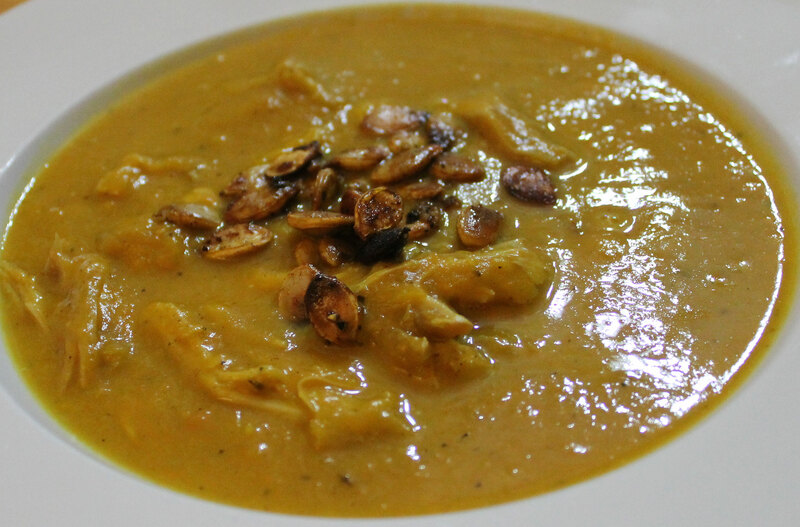 This soup is one that A made while I was feeling ill – it used some of the chicken bone broth that I had made and she thought that it would help me recover. I am sure that it did. This soup was designed to use up some of the leftover turkey we have in the freezer from the 2 turkeys we had over the Christmas period (one on Yule – December 21st, the other on New Years Day). You could no doubt use cold cooked chicken if you didn’t have any turkey though…. 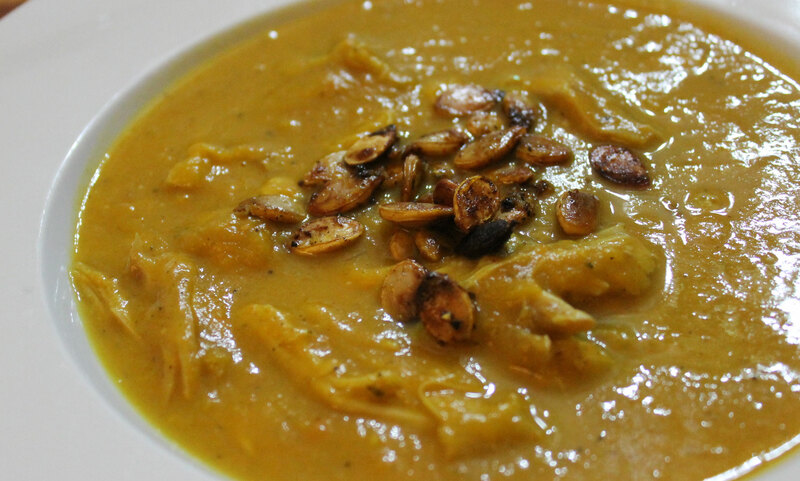 If you leave off the squash seeds, this recipe is Autoimmune Protocol (AIP) compliant. Seeds are a stage 2 reintroducton. I topped Hubby and the kids portions with the seeds and left them off mine. Melt the coconut oil in a large, heavy based pan over a low heat. Add all the vegetables and cook gently until starting to soften – about 10 minutes. Pour in the broth and add the remaining ingredients. Simmer gently for 20 minutes. While the soup is simmering, chop or shred the turkey into bite-size pieces. Once the vegetables are tender, puree with a stick blender until silky-smooth. Add the turkey (or chicken) and allow to heat through. Serve topped with roasted squash seeds if wished. Toss the seeds with the coconut oil and spices and roast in a preheated 190°C (375°F) oven until crispy and golden brown. These can be eaten as a snack, or can be used as an optional garnish on the soup. This entry was posted in Autoimmune Protocol Foods, Recipes, Stage 2 Reintroduction and tagged AIP-friendly, Autoimmune Protocol, gluten-free, grain-free, leftover turkey, leftovers, low-carb. 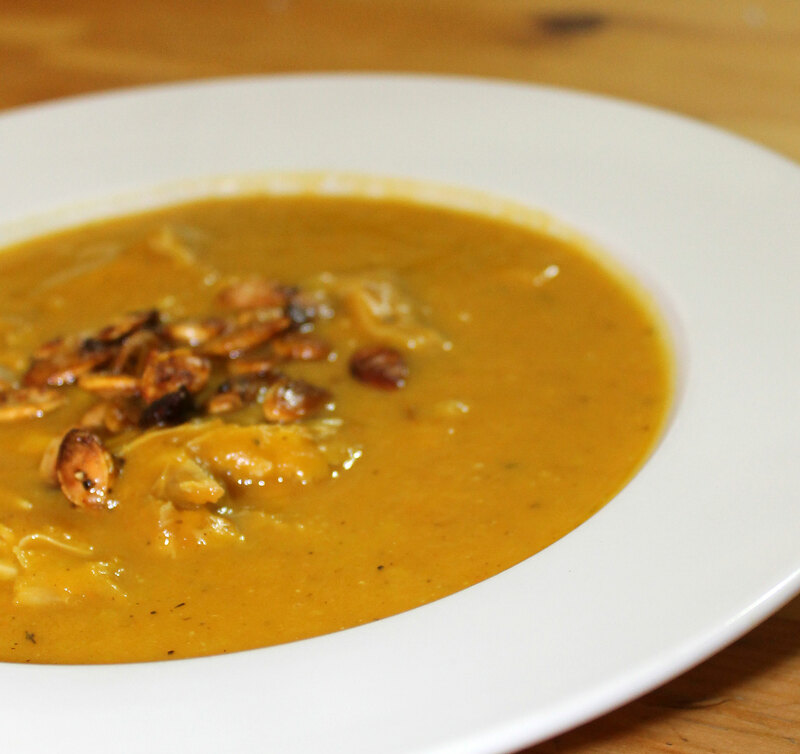 healthy, paleo, primal, soup. Bookmark the permalink. Will need to try this, Thank you! Glad you’re feeling better enough to post. Soup looks delicious!